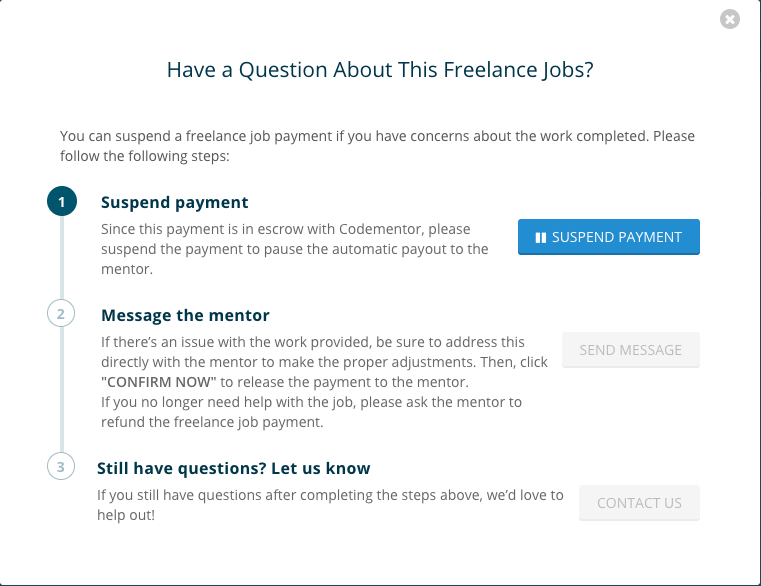 Codementor Support - How do I suspend the payment for freelance jobs? All Categories ​>​ I&apos;m a User ​>​ Getting Help ​>​ Hire a Mentor for a Freelance Job ​>​ How do I suspend the payment for freelance jobs? Users can suspend a freelance job payment by clicking the button "HAVE A QUESTION?" and then clicking on "SUSPEND PAYMENT" on the pop-up window. After users suspend the payment, we will pause the automatic payout to the mentor. If there’s an issue with the work provided, be sure to address this directly with the mentor to make the proper adjustments. Then, click "CONFIRM NOW" to release the payment to the mentor. If you no longer need help with the job, please ask the mentor to refund the freelance job payment. Feel free to contact us if you still have questions after completing the steps above - we'd love to help out!